Length: 4 – 7mm long overall. Long thread like antennae, long legs with spines at joints. Forewings are shiny golden with no markings. Trailing edge of the wings is strongly fringed. Eggs – are laid amongst fibres and fabrics. These will hatch at above 10°C in 1 – 5 weeks. Larva – whitish caterpillars that form silk tunnels, camouflaged with fibres and debris. They leave the tunnels at night to feed and hide during the day. Development takes 2 – 7 months. Pupae – inside last larval skin concealed in fabric. These develop from within 2 weeks – 2 months. 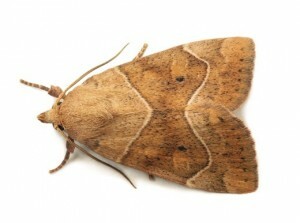 Adults – the female moth is quite sedentary, but the males do fly on occasions. Adults do not feed and are short lived. Attacks particularly textiles and animal products, for example wool, fur, silk, skins, feathers and leather. As they avoid the light they are often found in old wardrobes and furniture. Can also be found on clothes, carpets, curtains, sofas. At one time the common clothes moth was by far the most economically important clothing hosehold pest in Britain, an estimated £12millions worth of damage was caused by this one species alone.